USAF TSgt Edward Goettig reveals himself to his daughter Bailee at Lehi High School on Thursday, March 6, 2014. Goettig had been deployed to Afghanistan since Aug. 27, 2013. 11-year-old Addie Goettig reacts to seeing her father, USAF TSgt Edward Goettig, walk down the stage at Fox Hollow Elementary School on Thursday, March 6, 2014. Goettig had been deployed to Afghanistan since Aug. 27, 2013. 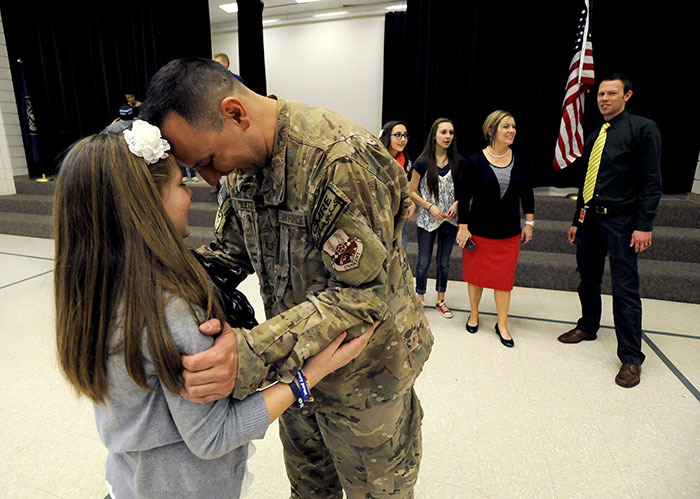 USAF TSgt Edward Goettig shares a moment with his 11-year-old daughter Addie after surprising her at Fox Hollow Elementary School on Thursday, March 6, 2014. Goettig had been deployed to Afghanistan since Aug. 27, 2013.